The Malacanang press report disclosed that the Arroyo administration is pouring billions of pesos to various infrastructure projects in the country to enhance business and tourism climate in the country and uplift the lives of Filipinos. Iloilo City (18 September) -- "The Iloilo Airport is now complete," declared DOTC Secretary Leandro Mendoza as he announced today that international flights will be coming soon in this part of the country. 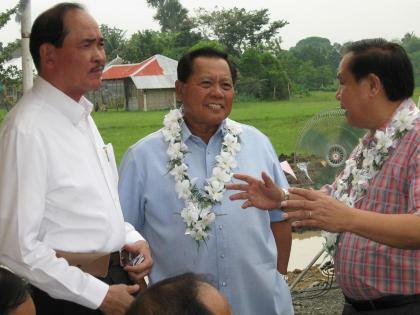 Secretary Mendoza, who led the ground-breaking ceremony of the P124 million secondary access road in Barangay Tabucan, Cabatuan leading to the Airport complex, announced that President Gloria Macapagal-Arroyo has ordered to establish an international desk which will be administered by the Customs Immigration and Quarantine. "Darating na ang international flights," said Mendoza as he emphasized that Iloilo International Airport had already been declared as an international destination. The DOTC Secretary said during the occasion that the Cebu-Pacific will launch its Iloilo-Hongkong flights, as well as the Korean Airlines which will mount Korea-Iloilo flights. "So this completes the Iloilo International Airport," declared Medoza expressing confidence that investors will come in to spur economic development in the region. This could be achieved because of the potentials of the area near the airport to become and industrial zone, "eventually becoming an economic zone". The project is one of the priority SONA commitments of President Gloria Macapagal-Arroyo. The groundbreaking ceremony was also be graced by DOTC Undersecretary Doroteo Reyes II, Asec Thomson Lantion, Asec Red Kapunan, Cong. 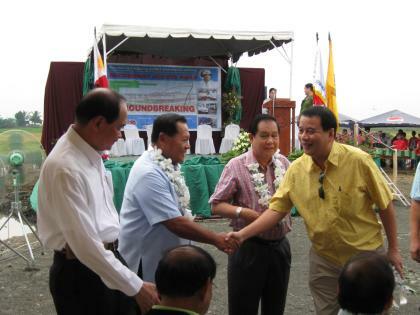 Arthur D. Defensor of Iloilo ’s third district, Iloilo Governor Niel D. Tupas, Sr., Cabatuan Mayor Ramon C. Yee, and other national, provincial and municipal officials. The road project which is expected to bolster the reginal economy will serve as an alternative road to the new Iloilo Airport for passengers coming from the northern and central part of Iloilo, the provinces of Antique, Capiz and Aklan. The secondary access road is a 3.2 kilometer-stretch from the national highway in Barangay Tabucan to the airport. It will be a two-lane with 5.5 meter width asphalt concrete pavement. Accordingly, the project covers an area of 64,944 sq.m., traversing the five barangays of Cabatuan, namely, Tabucan, Tiring, Talanghauan, Ga-ub, and Duyan-duyan. Iloilo City (16 September) -- The 124 million access road project in Barangay Tabucan, Cabatuan, Iloilo to the new Iloilo Airport complex is another boon to the region’s economy when completed within 210 calendar days. The construction of the secondary access road is a commitment of the Department of Transportation and Communication (DOTC) to provide an alternative road to the new Iloilo Airport for passengers coming from the northern and central part of Iloilo, the provinces of Antique, Capiz and Aklan. On September 18, DOTC Secretary Leandro B. Mendoza is secheduled to lead the capsule-laying ceremony of this multi-million infrastructure project in Barangay Tabucan, Cabatuan, Iloilo. The groundbreaking ceremony will also be graced by DOTC Undersecretary Doroteo Reyes II, Cong. Arthur D. Defensor of Iloilo’s third district, Iloilo Governor Niel D. Tupas, Sr., Cabatuan Mayor Ramon C. Yee, and other officials. The implementing agency of the project is the DOTC through the Project Management Office of the New Iloilo Airport Development Project in coordination with the LGU of Cabatuan.